Figure 1 is a photograph of representative plants that we carefully removed from each of our three experimental units. The mid- and high-CO2 plants appear to have nearly identical root systems, while the root system of the low-CO2 plant is not much smaller. In terms of aboveground growth, however, there are considerably larger differences. The low-CO2 plant is much smaller than the others; and the plant from the high-CO2 unit is significantly larger than the plant from the mid-CO2 unit. Figure 2 depicts the mean dry weights of the roots and tops of all plants from each experimental unit. 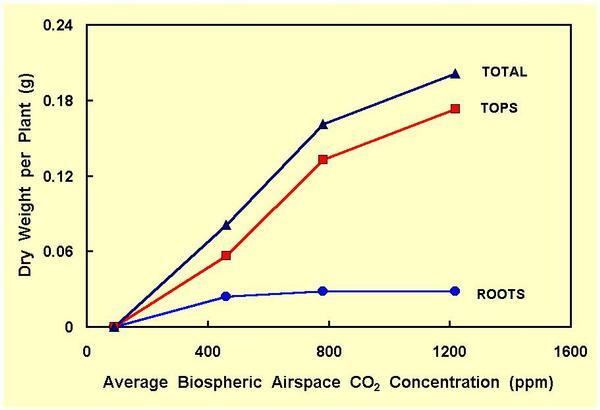 Since death appeared to be induced by an airspace CO2 concentration of 92 ppm in this experiment, we have started the three graphs of root, aboveground and total plant biomass from that concentration. In accordance with the photograph of the representative plants from each experimental unit, these actual dry weight data also indicate that there were few differences in root growth among the three CO2 treatments. Perhaps this is not so unusual, however, when it is remembered that root growth was explosive early in the experiment, penetrating all the way to the top of the layer of saturated sand by the time we began our CO2 measurements. Hence, the root systems of the plants in all three units were probably fairly well developed before the CO2 concentrations of the three units diverged much from each other, which is yet another reason for not planting the peas until the Pothos plants have had about a month to draw down the internal airspace CO2 concentrations in the mid- and high-CO2 units. The major CO2 effect of this particular study was thus observed in the aboveground portions of the plants, where a doubling of the CO2 concentration characteristic of the outdoor environment (365 to 400 ppm) more than doubled the dry weight of the visible parts of the plants. 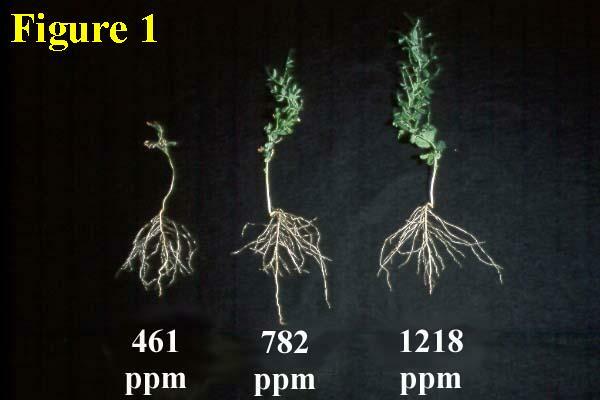 And since the aboveground plant parts were so much more massive than their root systems, such a doubling of the air's CO2 concentration also more than doubled the productivity of the entire plant. This response is probably more dramatic than what would have been observed in the undisturbed outdoor environment under ideal conditions; for the plants of our study were clearly stunted, and there is much evidence to suggest that the effects of atmospheric CO2 enrichment are more pronounced when plants are exposed to various forms of environmental stress (see Subject Index Amelioration of Environmental Stresses). In conclusion, if we were to perform this experiment again, we would not plant the pea seeds until the Pothos plants had grown for a month or so and we had established relatively stable CO2 concentrations near the levels we desired in all of our experimental units. Nevertheless, and in spite of this deficiency, we consider the experiment to have been a success, as much was learned about the methodology of such studies, and the importance of high levels of atmospheric CO2 for plant growth and development was clearly manifest in the results.